Jose Vazquez passed away April 30th, 2017. He was beloved by friends and family and was known for his tireless work ethic, sense of humor and love for life. His passing was a peaceful one, surrounded by family. Jose was born in Michoacán, Mexico to his father Agapito Vazquez and mother Petra Lira. He came to the U.S. as a part of the Bracero Labor Program circa 1950. As a Bracero, he was brought into the U.S. from the central Mexico highlands via train, riding atop a cattle train the entire voyage. Through that program, he served as a laborer for the US government, working through Texas, Arizona and California in the harvest of crops ranging from cotton to tomatoes to oranges. 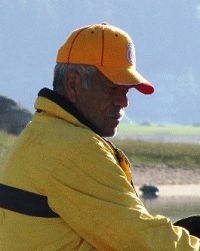 Jose decided to start a family, married and settled in Santa Barbara, California in 1967. Jose was a well-established resident of Santa Barbara from 1967 on, building a successful landscaping business and establishing a strong real estate footprint of rental properties in Santa Barbara. Jose’s tireless pursuit of a better life for his immediate and extended family was the embodiment of the American Dream. Jose was an avid Dodger fan, teaching himself English through the Vin Scully radio broadcasts. He was also a soccer fan, cheering on the Mexico team and the Monarcas from his home state of Michoacán. More than anything Jose was a devoted father and grandfather. Jose was happiest with a child in his arms, patiently walking them through his many gardens and explaining all there was to tell about the plants and trees he so deeply cared for. Jose is survived by his wife of 50 years: Noelia, his sons: Roberto and Jose, and his daughters: Yolanda and Graciela. Grandchildren: Jose Vasquez, Esteban Mendez, Miranda Vasquez, Diego Vasquez, Adrianna Vasquez, Arianna Allison, Isabella Vasquez, Alina Allison and Maya Cruz. If wished, in lieu of flowers, donations can be made in his honor to City of Hope.